Find out more about three of the authors in the Crux Anthology. I couldn’t help reblogging this entertaining and interesting interview (more of a conversation between three authors we get to sit it on) between host author Joy E. Rancatore, R. J. Rodda, and Audrey Driscoll. Following is a snippet, but don’t miss out on the rest. These ladies are smart, and their conversation is one we can all enjoy. “The Crux Anthology” Available Soon! I was thrilled when I actually finished my story and sent it in, and even more thrilled when Rachael notified me it was in the top ten. Then in May, I was totally chuffed that my story won Third Prize. You may recognize some of these folks as bloggers. Here’s a chance to read a curated selection of their fiction. Just so you don’t miss any important details, click here to sign up for the Crux-specific newsletter. The release date is November 26th, but you can pre-order on the 19th. All sales proceeds will go to the charity Compassion International. I’m inflating that balloon again! The ebook version of She Who Comes Forth launches on Wednesday, November 7th. That means there are only three more days to pre-order at the special price of $2.99. My hair flopped into my eyes—again. I tried to blow it out of the way, but that never works. I pushed it behind my ear for the hundredth time that day, my dirty hand adding to the accumulated grime on my face. Sighing, I turned back to the pile of rocks in front of me. Check for inscriptions. Check for chisel marks. Attempt to discern shape. Sort and classify. The clink of tools on stone and the murmur of voices blurred into a distant hum, joined by the drowsy buzz of flies. Even in the shade of the tarp stretched over the sorting area, it was hot and getting hotter. “Hello, Miss America!” The Grinner arrived with another basket of rocks. His thin body jiggled under his grey galabeya and his eyes squinted under his faded blue turban. “It is beautiful day! Very happy to see you!” He was smiling so hard I thought his face would split and the top of his head would fall off, turban and all. “Hello,” I said. I couldn’t remember his name. Ali? Omar? I couldn’t keep them straight. To me, this one was “the Grinner,” and I couldn’t call him that to his face. “Please put that here.” I pointed to a spot next to the basket I was working on. “Thank you. Very much.” I turned back to my current rock, hoping he would take the hint and leave. “I’ll keep that in mind.” Even my sarcasm-producer was weary. “All right.” I blew a raspberry at his departing back and picked up a rock. Check for inscriptions. Check for chisel marks. Try to discern shape. Sort. Classify. Wipe sweat, push hair behind ear. 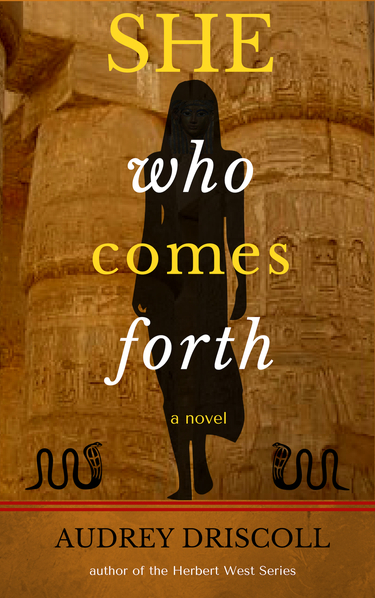 The ebook version of my soon-to-be released novel She Who Comes Forth, is available at a special pre-order price of $2.99 from now until the release date, November 7th, 2018. This is the work in progress I’ve been blogging about for the past year or two. Finally, it exists as something more than a pile of paper and a bunch of Word docs. The novel is a standalone sequel to the Herbert West Series. Readers who enjoy a combination of realistic adventure and supernatural elements in an exotic setting — Luxor, Egypt and the Theban Necropolis — may wish to have a look. October 1962. The developing nuclear missile crisis in Cuba is of no concern to Francesca “France” Leighton. Recently turned 21, France travels from her home in Providence to a job at an archaeological dig in Luxor, Egypt. She takes with her two legacies—an emerald ring from the grandfather she never knew, and an antique cello from his friend, a man she loved like a grandfather. The dig disappoints. France is relegated to sorting chunks of stone, the dig’s director makes unwanted advances; rivalries and mistrust are everywhere. And it’s too darn hot! Tasked with playing her cello at a gathering of archaeologists, France meets the enigmatic and fascinating nuclear physicist Adam Dexter. She’s smitten, especially when he promises to show her the secrets of Egypt, including a hitherto undiscovered tomb. After a risky balloon cruise ends in a crash landing, France is forced to leave the dig. Despite warnings against solo explorations on the west bank, she finds herself with Adam Dexter in an eerie house near the Theban Necropolis. Adam’s promises are alluring, but he is both more and less than he seems and his motivations are disturbing. Fleeing his house, France makes a horrifying discovery. Through an image of Osiris, France discovers the true reason for her presence in the Theban Necropolis. As the world teeters on the brink of nuclear war, she must call upon resources both within and beyond herself to meet the perils that await her in the world of the dead beneath the Western Peak.